Are you surprised this is happening? What other Nintendo games would you like to see receive VR updates? Tell us below. BOTW in 1st person view ?! Super Mario Odyssey in 1st person view?! Alternatively I could sit with the Switch/TV an inch from my face. Right, now this is huge. Dare I say it but we could be seeing a Metroid Prime 4 with VR? That would totally suit the perspective. This is crazy nuts! Amazing! Lol. this does pique my interested for it. 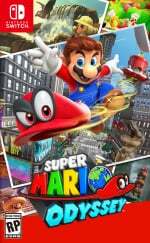 edit: dang, looks like Odyssey isn't being fully supported, and is just mini missions. (at least from what Nintendo was saying). Nintendo just like “Oh yeah this is happening whatever no big deal”. Is this just a few minigames, or can you play the whole game like this? While it's not first person I think some people are forgetting the fact that we will now essentially have BOTW in 3D! well Nintendo just made VR a thing. Ok now I'm slightly interested in vr botw. But I don't want cardboard! I didn't realise you could wear the googles. I thought they had to be held to the face. Novel but..... since it's not in 1st person and you're only VR Controlling the camera (Based off the Video), then its pointlessly adding more steps to do what we just did with a thumb-stick back when these games launched. Anything not 1st Person doesn't really have practical business being VR. I would have expected to see this announcement 3 days ago. 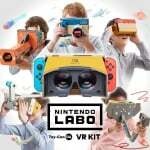 I'm getting Labo VR for my birthday, but now I might have to get BOTW too. You do have to hold it, but I guess you can use the joycons while holding it. Not sure how easy that will be though. That’s not true at all. Some of the best VR games out there are third person. 3D platformers in particular are excellent in VR. I have PSVR and Rift. VR is just a perspective. When playing third person games it’s like your watching a diorama unfold before your very eyes, while controlling the character with the controller. We don't really even know if gyro controls the camera, it may just be sticks. We don't even know if its in 3D, do we? They might have just split it to two identical screens and did the minimum amount of effort. Wouldn't the games have to be designed with 3D in mind to be able to be run in 3D? @PaperLucario, given that Astr Bot: Rescue Mission is considered to be one of the best VR experiences out there (many consider it THE best available on PSVR), and Moss was really good too, 3D platformers work really well in VR. Not sure exactly how well these two particular games will work since they weren't designed for VR, but color me intrigued. Lol. That's all I have to say about this. Dang! Eagerly awaiting reviews on this! My kids and I still have our eyes on the Vehicle Kit but now I'm looking at this too! Real question: where’s Mario Kart VR? I just can’t see how this will work with a 720p screen. I have a PSVR and its really cool and usable, but even that is held back a bit by the 1080p screen. I have no idea what they would even use it for. The new Mario Odyssey VR-compatible minigames look interesting, but BREATH OF THE WILD VR, WAT!!! Playing either of these games in VR doesn’t really interest me, but I’d be on board for Mario Kart, Splatoon, or Metroid. That’s what we all said. @JaxonH Hey, I’m a Nintendo fan and would love to see this succeed so I’m all for it, but I am skeptical to a degree. Prepare to make an appointment to the optometrist after going to Korok Forest in VR. If you have to physically hold it up to your face the whole time then it sounds way too uncomfortable to use. Look forward to read the reviews for players and Nintendolife. The dozen of people who are negative all the time and the real Nintendo fan will be interesting to see the difference of opinions. I'll probably try it for a few minutes and then proceed to forget it was ever a thing. I can see how some people might be into it, though. I'm on the fence about this. It sounds fantastic, but unless there's a way to strap it to your face this just sounds like a distraction. Will have to wait and see more. Will wait to see impressions of this but now I’m actually considering buying the kit. Well now... this is interesting. Impressions please! @Pichuka97 I fully expect Mario Kart VR that would make a lot of sense. @Anti-Matter not in first person.. I was already getting the full kit, the added garage features sealed it for me. But this was a nice bonus to see quietly dropped into my newsfeed. Botw in VR...Well played Nintendo...well played indeed. I have many more questions than answers, but I'm unreasonably hyped nonetheless. ... I JUST spent 40 bucks on a couple of 3DS games. I D E E P L Y R E G R E T T H A T D E C I S C I O N .
I hate to be the buzzkill here, but the VR isn't in first person. When I heard Breath of the Wild was being given Labo VR support, I was so excited. I then watched the trailer, and the excitement was dulled when I found out it's still in third person, thus... negating the purpose of VR. If it's in VR, aren't you supposed to feel immersed? Because the most this VR kit really makes you do is make your head the camera instead of the control stick. The Super Mario Odyssey support is honestly less disappointing. Yes, unlike BotW you can't play the actual game through, but they actually have some side things and new objectives set side for the Mario Odyssey. 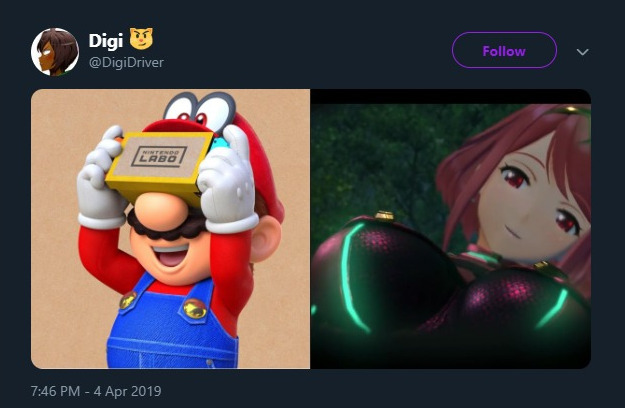 And made it more like you're interacting with Mario like he's a Pikmin instead of playing as Mario in a third person perspective. Overall, this disappoints me. It might work. I hear 3D platformers are great for VR, so I have no doubt Odyssey will be fine. But... I don't have much hope for the Labo's BotW support. Enjoy BOTW and Odyssey im glorious 360p! Isn't this about the same as stereoscopic 3D? Where's the virtual reality part? 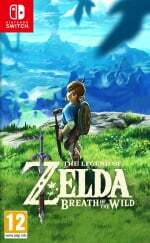 How is the Switch rendering BotW twice without major sacrifices? If it's not first person, what's the point? 3D? My TV can convert that. I have no problem holding it to my face with the joy con connected. Maybe I will just lay on my back in bed or the recliner. Awesome!!! I’m looking forward to it! It might not be for everyone, but I can’t wait for my Son to experience it! Ok maybe ill give this a go. In case you dont' know, Target has had the Vehicle, robot and variety kits on sale the past 10 days or so for $20. It's nto an advertised sale, and it's nto clearance either, and they are probably mostly sold out by now, but my Target had a couple still today, I bought the vehicle kit last Friday. My wife is still upset about it, but what are you gonna do? Not using cardboard though, going to buy some plastic at the hobby store, trace and cut the pieces and superglue them. I get this if Mario Kart 8 goes VR and plays just as good as how the HTC Vive version did. So labor could prettyuch pull off the Mario Kart VR .... Using labo!? Oh my god, I’ve already preordered the full-fat VR Kit before even seeing the first video. I wasn’t expecting this at all really, I just love Labo, and now I’m kind of freaking out. This is very cool! @BenAV You could, you know, make a strap? I mean it's not like it's plastic. Ok. I’m not on board with this version of vr BUT, if they do this with the rumored Metroid collection. I’ll do it. No thought. I’ll do it. If Metroid Prime Trilogy is coming, I hope it's gonna have a VR mode. As for these two, Odyssey seems like a small handful of missions that give you coins and nothing else, and Breath of the Wild is basically Breath of the Wild 3D. Cool ideas, especially the latter, but nothing that gets me too excited. @PaperLucario Everyone that tries 3rd person VR knows it has huge value. Try it for yourself and see. @DFaceG_Rebooted 3rd person works and is immersive regardless of genre. It doesn't have to be just platformers. @KingBowser86 Your 3D TV adds fake depth cues. It's nothing like VR. @Nicolai Nope! You just need to duplicate the camera object, and set it so that it's about as far apart as a person's eyes should be in game. I mean, it obviously depends on how the engine handles cameras, but there's a good chance it's really easy to do. I’m not sure about the materials, quality, and comfort of this VR setup. After all, you don’t sit down and play BOTW for 10 minutes. For the first time it might actually be a better option to look to 3rd party manufacturers to replicate this headset. Someone could easily create one of these that is more comfortable, with a headstrap. Would be worth it if you were planning to replay all of Zelda again. Right so the game that can't hold a steady 30fps is now magically doubling its framerate with no loss in visual clarity to work properly in VR? Either Oculus/Vive/PSVR don't know what they are doing or Nintendo are some good like miracle workers. Or the game will look terrible in VR and how are you meant to play it whilst holding that you your face? @PaperLucario @RR529 you're kind of both right, I've played many VR games and in general first person games are far more engaging but Astro Bot is still comfortably the best game I've played in VR. However strictly speaking whilst that game is predominantly a 3D platformer, you actually are playing in first person as you play as a character that physically interacts with the world, with the little Bot running around you as you work together. @carlos82 The Switch already had VR technologies built within it, Nintendo just need to make an accessory to access it just like how the Sega Genesis already had SMS capabilities built within it and Sega just need to release an add-on to be able to use those. @retro_player_22 what? How are those even related? A Genesis playing a Master System game is easier than the Switch rendering a game twice whilst doubling its framerate, it's VR technologies will be related to how the screen works and not some miracle cure for its relative lack of processing power. I'd love to be wrong and Zelda to look amazing in VR but all of my experiences with VR so far say that it won't. -Labo with the VR: people like that little by little has interest, but as still "there is cardboard" in the formula and adding that it seems not too much interest also for the VR, still the final is "meh". 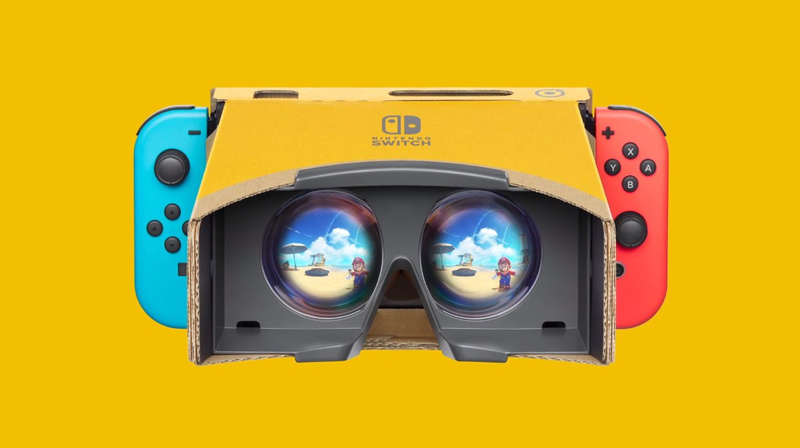 -Labo with VR for Mario and Zelda: almost everyone sees interest, even if there is cardboard, they even have ideas for more games. @SakuraHaruka Content is what sells hardware afterall. That's actually really cool and this makes me consider getting Labo VR. Even if BOTW runs at 10fps and gives me arm cramps, I'm now buying this. Step 1: Lay Switch with VR Labo configuration flat on edge of table with Switch backside down. Step 2: Connect controller, get on knees, lay face against Switch Labo configuration with neck at 90 degree angle. Step 3: Question if this was worth it. This could be the first step before a play to re-release Ocarina of Time 3D and Majora's Mask 3D on Switch without sacrificing the stereoscopic 3D effect. I also love the idea others have suggested that this sets up Metroid Prime Trilogy well. All of that especially if a Switch Pro model comes out that ups the resolution/framerate to make those experiences slick. This makes me very hopeful! I think that Mario is just a few mini missions. But BOTW, that's a different story. I NEED THIS NOW! @Leon_Kennedy I suppose it's an option for any developer now. Who knows, maybe based on your avatar even a 3D mode for Resident Evil 4. But I don't know if I'd hold my breath for Capcom to integrate a feature like that. Okay, this is pretty cool. I'm still not 100% sold on VR, but Labo VR is under $100 so it wouldn't break the bank if I just wanted to use it occasionally. That's mainly what puts me off PS VR and the like, even if the experiences are cool, I wouldn't use it that much and couldn't justify the hundreds of bucks it costs. BotW in VR might be worth it alone, we'll see. I'm surprised Nintendo isn't releasing a headset for these. It might open the doors for games like ARMS or Splatoon 2 that rely on motion controls. Even the thought of playing BotW in 3D by holding the Joycons at eye level sounds uncomfortable. Well, if Nintendo doesn't make a headset, maybe a third-party company will, hopefully with plastic. Even then, it depends on whether or not you can detach the Joycon from the Toycon VR Goggles for these games. @Anti-Matter unfortunately that’s incorrect. Check out the twitter footage. What else could get a VR mode with LABO? @RandomNerds PSVR is 1080 split between two eyes. 540p each eye. That’s why it looks blurry. Also I do not believe this is going to split the image. So it’ll technically be 720p no matter what. I've been saying it for years and now i'm sure. metroid Prime 4 will be V.R. All we need now is a decent third party headset. Does anybody know if there are any visual acuity requirements to fully enjoy the VR kit? Do you need 20/20 vision? How on earth is this going to work without the device being strapped to your face? I'm going to climb to the highest point in BOTW, jump, glide then stick those goggles to my face,while a fan blows in my direction. @Snakesglowcaps The 720 is vertical, so the screen would be splitting 1280 horizontal, making it 640x720, which is probably why the visuals aren't as bad as everyone is expecting. How are you going to hold it to your head and control things without a head strap?? This is just stupid. Also its not true VR as that would mean first person viewing. @Snakesglowcaps would the approach suggested by @link3710 not work? What about software updates + a polarized or color-coded anaglyph lense filter add-on to the headset? Considering we're comparing it to the 3D effect created originally on the 3DS, which required no glasses, is the bar really that high? Do we have to play with the joy cons attached? Didn't see that one coming.... I do have a PSVR and certain games like Astro Bot for example make me feel quite ill when I play it so I'd need to know a little more about it before investing. Fortunately the VR Labo kit costs peanuts compared the the PS version so it would be fairly low risk. @mist I am shortsighted and VR does look very blurry without glasses. You can wear your glasses under most VR headsets and I think I have heard that this works for Labo VR as well. For my Oculus Rift I have bought some special prescription lenses that clip onto the existing lenses inside the headset, because I find it a lot more comfortable. I want them to port Virtual Boy games into Switch and then I might be interested in these VR goggles. Not gonna lie, now that Nintendo surprised us with Mario and Zelda in VR, we NEED Star Fox in VR. And imagine the possibility of Metroid Prime Trilogy supporting this, Holy Crap that would be sweet! @DartBuzzer For sure, but it's already paid-for and I don't have to strap it to my face via cardboard. BOTW in VR, now Labo actually has a purpose!!! 1. This is not VR like PSVR or Oculus. Watch the video before you comment. It’s not in 1st person. 2. The screen is 720p, which will make the screen more blurry than everything else on the market. 3. You can’t attach the device to your face. There’s no strap. So you have to put your arms in the air the entire time. 4. If this was such a big deal, wouldn’t they have announced it with a Nintendo Direct? They know it’s of very low quality, hence why they announced it via Twitter. This is just the Virtual Boy all over again. For both games you need to hold the controller in your hand... And the screen doesn't have any motion sensors... Which means no head tracking. This is Nintendo's version of Google's daydream... But not as good. Will the games appear too be in 3D? Nice nice, cool cool cool. Might actually finish Zelda now. since the joycons need to be attached to the system for accurate camera motion, anyone else think it might get tiring holding the headset to your face for a long period of time? I love it when a masterplan comes together. @OorWullie I'm a fan, and I hereby volunteer to blow in your direction! These are going to be tiny experiences. They're sweet bonuses. But LABO VR remains only really worthwhile for kids or parents with kids. VR and 3D doesn´t nessecarily presuppose first person view. That´s nonsense. Look how much VR games on other platforms are non-FPV. There are even whole jump & run games available in VR. VR doesn´t presuppose first person. @boxyguy I have fibromyalgia and this is the main reason I'm not getting LABO VR - it's going to get uncomfortable to use after a short while and my body can't handle that. I have to save my money for a proper VR system instead. I'm hoping Nintendo link up with Oculus Quest. Curious now, though I can't say a 720p screen is going to be great in VR. I've used Google Cardboard which is basically this same thing before and while it's fun for a few minutes it just isn't a servicable VR experience for more than a few minutes. Now I want to buy the smaller set. @Lionyone i think i can give the actual Labo VR games a pass cause they seem to be made to play in short bursts, plus the games are made with vr functionality in mind. mario and zelda on the otherhand im not so sure, i can imagine this being a thing people try for a couple minutes then never again. This would be amazing if it wasn't going to be absolutely terrible. Low res screen, low frame rates and low quality VR goggles you have to hold up to your face? Doesn't sound great, unless the rumoured "Switch Pro" can deliver better frame rates and resolutions. As long as people keep their expectations in check, then this could be a fun, budget way of experiencing VR. Edit: After reading the first few comments people are clearly letting their over excitement get the better of them. Breathe for a second and remember that this a very limited version of VR. These aren't PSVR versions of SMO and BOTW. And you aren't getting anywhere near the level of control and detail. Glad they didn't go first person. Mario games, and platformers in general, aren't designed for that kind of perspective. can't say much about Zelda having not played it. I think that what makes sense of this Labo VR is that it's not designed for long sessions and more for quick plays. The only game I've been really enjoying on the PSVR is Beat Saber. Even Astro Bot takes too much time for me. So I think that Labo it's going to be a nice VR demo experience, that comes cheap in a moment where VR is not mainstream, but more of something people is curious about. It's a great timing IMO. So...do you have to hold this thing in the air against your face while you play? See alot of ignorance in the comments. People who dont have a clue saying VR "needs" first person. These people have no idea what VR actually is. First person is just a genre that works well in VR. Its not required, and its not the only genre that works well. Okay, NOW I'm completely satisfied with Labo VR. My Oculus GO has literally 4 times the pixels of Switch and I still get that screen-door effect. Can't wait to try this Labo VR and get that 8-bit Minecraft effect. I will wait for a better VRSet. I think that if this works well enough, we should get from Nintendo an Oficial VR Switch headset. Would make completely sense. 30 public.ExclaimLoudly(headturns[train])"FULL SUPPORT FOR BOTW?!" 40 private.ThinkLine() "...wish I hadn't bought that for Wii U"
If you listen to the usual critics around these parts, the cardboard isn't what will be terrible about these. But really, it ain't the ideal material, and if you are an adult, the spacing of the eyes won't appeal to you at all. With the amount of support Nintendo is already providing for this, you're likely to soon find cheap Switch compatible third-party substitutes that are more to your liking. @Aozz101x @Malcrash I hateto be that guy, but it's "piqued" not "peaked". This is pretty neat and it will definitely help to sell a little more VR kits. The price point is low enough that people will purchase it out of curiosity. Of course they will appear to be in 3D. A separate image for each eye will be generated. Whether you will need to hold the VR set yourself remains to be seen. We don't know if a head strap will be included with the VR kit. They just haven't shown one. Similarly, we don't know whether sensing of head motions will be supported. It is possible you would be allowed to play Zelda with a ProController, and attach one of the joycon to the headset. But yes, most likely, it will be dreadful. @Pod oh, I know the cardboard is good! I have the Variety Kit and I was really impressed! But for a headset I dont like that much! I have Google Cardboard and it is very unconfortable for more than a 15 minutes play. I will wait for a version with headstraps! Well guess I’m getting Labo now! I am pretty hyped for this because I love Mario Odyssey and another reason to play the game is just fine with me. Now when is ARMS VR coming out? "The VR Goggles are handheld goggles and should not be secured to the head. During VR mode, you can stop playing and take a break at any time." So I highly doubt it will include the strap. It's cardboard though so improvisation shall do the trick. I have PSVR, now I will definitely be buying Labo VR:) win win situation. @Snakesglowcaps Actually PSVR and LABO VR work exactly the same way. One screen displaying two images (one for each eye) Then a set of lenses to properly focus said images to create the 3D/virtual effect. The PSVR has a 1920 x 1080 screen which is 960 x 1080 per eye. The switch has a 1280 x 720 screen which is 640 x 720 per eye. The point is both systems have one screen and the horizontal pixels are divided in half for each eye. So the more pixels you start with the better. NOW you have me interested. I'm gonna add this to my christmas wishlist for 2019! Why are people comparing £250 PSVR to £30 LABO VR? Obviously it won't be the same experience - it's not meant to be. I'm increasingly convinced that Nintendo developers would rather play with new technology than focus on making great games. VR will never be mainstream because it is uncomfortable for the eyes. And a VR made for kids is almost certainly going to bomb because few parents are going to allow their kids' eyes to be put at risk. I wish Nintendo would stop giving us gimmicks and just give us great games. This will be fun, but I don't think anyone should expect that they will be playing BotW for hours this way. It's going to be a muddy low-res feeling with major screen door effect — kind of like "you are there" wearing goggles with a thick coat of grease. Even so, the feeling of presence and scope that you'll get from just looking around from within BotW means I'll probably be revisiting many places just to look around and then go back to normal. Which is totally fine. Being able to do this in Nintendo games without a $300-$400 investment (and a simple/fun DIY project to boot) is just another facet of the beauty of the Switch hitting the market at just this moment in video game history — and of Nintendo's fun-first perspective on gaming. Does this mean it comes with a head strap?? @IANVARIVS It's too bad you can't dock the Switch with the VR goggles on... I guess you could with some third party solutions. But that would be the best. Play on your TV pick up the goggles to get into the VR temporarily. Then, set it down to play again... hmm... might have to rig that up. I don't get it. It's not 1st person? You control the camera on 3rd view with your head? Get it some head straps and make it compatible with MK8 and I'm sold! @Broosh I got excited - until I realized it simply moves the camera around ... Perfect fodder for modders though. @RandomNerds are you 100% sure this is how Nintendo’s VR will function? Well, now I'm almost certain thr "Switch Pro" model coming out will be more geared towards VR. The Switch is a perfect VR device, aside from the lowered visual output. The HD Rumble joycons offer something that PSVR can't, and it's part of the default Switch package regardless. Not bad for a late surprise 3 years in, but I wonder if they can go from gimmick to practical. @Noid I wouldn't be so sure. There are 1st person platformers like Mirror's Edge. In VR, 1st person platforming is actually extremely good and precise because you can do more free-form parkour. @JDORS VR will be mainstream eventually. Saying it's uncomfortable for your eyes is to acknowledge the vergence accomadation conflict, which is a solvable issue. Prototype headsets have already almost solved it infact. Oculus Half Dome lets you focus your eyes naturally. Eventually light-field displays in VR headsets will make it 100% natural like real life with the only caveat being subjected to blue light which we're all used to anyway. It's a cool bonus, I guess, but it honestly doesn't excite me too much - it doesn't seem that much better than just playing SMO and BotW on a TV or in handheld mode to me. Plus from what I've seen, the way the VR goggles are held looks...uncomfortable. I'd hate to be all negative, but those are just my two cents. Does this mean we get to see the entirety of breath of the wild in 3d? Like, real, not faked just glued on your eyes? Because that will surely make me buy a vr headset. A better one than the cardboard version, that is. It clearly shows you sliding 1 Nintendo Switch into the Labo VR setup. I'm not trying to say something negative about the Labo, I was merely pointing at that as a PSVR owner I'm surprised Nintendo is doing a such a big VR push with a screen that is lower resolution than what is commonly accepted as the minimum for playable VR. That being said something I've always loved about Nintendo is their ability to turn less into way more than any other company could have. It's actually part of their culture and how the gameboy came to be. The term is called, "Lateral Thinking with Withered Technology"
@RandomNerds I had assumed that the Switch would not be powerful enough to run a split frame of BOTW and that Nintendo was using some technical magic with the goggles to trick the perspective. Even now I’m having a really hard time imagining the system doing it, I hope it doesn’t cause a god awful framerate, the BOTW footage was obviously just stock footage. Odyssey I could understand as it’s a fixed angle and a tech demo seemingly. @Snakesglowcaps Exactly. It boggles the mind to think about BOTW in VR using the current hardware, but Nintendo might be able to pull off something amazing, we'll just have to wait and see. Don't get me wrong, I'd love to play BotW in 3D but there's no way I'm replaying through that game while holding this thing to my face like an old school picture viewer. I need a proper headset with the freedom to move my hands how I see fit. Tried to scan through and see if someone mentioned this, so forgive me if I missed it. What if that Best Buy ALttP listing was for an updated "3D Classics" version like they did with some NES games on the 3DS? Not sure if that's technically feasible, but it would be pretty sweet. Make the pixel art characters pop out in the foreground and give depth to the background. Basically turn the game into a moving shadow box. I'd play it. @DartBuzzer Surely the Oculus has a blue light filter too, doesn't? I use one on my phone, I don't see why a VR headset couldn't. At any rate, if this definitely makes Breath of the Wild in stereoscopic 3D, I'm all for it. I don't care about resolution, I played everything just fine on the 480p screen on the Wii U gamepad, and I bet there's some DIY solution to strap that thing on my head. I am now officially interested in Labo VR!!!!!!!!!!!!!!!!!!! Congratulations, Nintendo. You, and my tax refund, convinced me. @Anti-Matter Doesn't look like that. On the Mario bit the camera was stationary, so that's probably how it is going to be. In BotW's it doesn't look like it switches to FP so you'll just probably experience it with the normal camera. I'd be a lot more interested in trying this if we had a plastic headset to use it on. But on the plus side, once the VR fad inevitably passes like the 3D one did, cardboard is recyclable. So there's your environmentally responsible Nintendo. @Baker1000 Sorry pal, you're going to be waiting for the rest of your life if you think VR is a fad that will pass on. It's here to stay. VR has always been one of the end goals of multi-cellular civilizations hence the fermi paradox. We're still very early, but that fact alone ensures it's always going to be important. Even without some crazy brain interfacing stuff, it's still going to be core to society and that includes entertainment and gaming. How very closed minded of you. There are 3rd person VR games that work very well. An excellent platformer on PSVR Astrobot, and Luckys Tale and Cronos on PC. All look and play great. VR doesn't only need to be first person to be fun. You're entitled to your ignorant and limited opinion of course. I just disagree. Still that doesn't mean the VR implementation in SMO and BoTW will be good and the Labo headset does not look comfortable. @Aozz101x Hey, FYI in life: nobody cares about you losing your save files. Thats boring filler. On boards like this and in real life conversation. Learn to edit things like this out of life. This will make you more appealing! @pullmyfinger Thanks for letting me know? i don't really care if anyone does or doesn't. but, since you had the time to @ me. i will take your tip and used my switch to play BOTW, without having worried or mention it again. I wonder if anyone has it in them to 100% Hero mode exclusively in VR? @Snakesglowcaps @RandomNerds BoTW was originally a WiiU game. There is enough of a power gap between the WiiU version and the handheld Switch that another optimization pass could give us more improved visual clarity and a cleaned up framerate. Maybe we could see a higher resolution bump that gets supersampled down to 720p, similar to what FE Warriors does? Well, perhaps I will need to pick up the $40 VR Starter kit to mess around with this. BOTW in VR. Ok, just like that, I'm buying my first Labo kit. Though I still don't have high hopes for it. PSVR is wonky enough. The screen isn't going to be amazing for this. But....BOTW in VR.....wow. Breath of the wild VR??? Okay but I won’t get my hopes up just yet. I expect it will be something like Link’s Crossbow Training for the wii but with some shrines. Either way I’ll probably be tempted. I'm curious but my expectations are very low. There is no way that holding the goggles up to your face while still using the joy-cons to play either game is going to be good. Do a proper VR set. You know, NOT made from cardboard and the we will talk. It's clear reading the comments that most people still don't understand what VR adds to the experience. You folks will be quite surprised when you actually try it. And I'm going to be frustrated when quite a few people actually enjoy it, after advocating it for some time. VR is great. But VR on a Switch screen with cardboard is not going to be great. Even the major headsets for PC struggle with resolution. Guess I gotta get ze goggles then. LOL none of these nerds are going to have the arm strength to hold that up to their face for more than a few minutes at a time. @Savino The part of the goggles that touches your face is made from plastic and there is almost no pressure on your face because there is no head strap. That probably makes it a lot more comfortable than Google cardboard. @countzero I know! Already took a good look on it! I am a huge VR enthusiast! But the fact that you have to hold it with your hands feels like a no-go for me! But I will wait until I have tetsted it! @Malcrash That would be an Immediate Insta-Buy!!!! @Reigestugatensho I know the feeling very well! This vr is not designed for long play. And it has no strap so you can only play botw a little before your arms get tired of holding the system in that position. Nintendo almost had something but a strap is going to stop them from making it fun. I just want Switch-adhering VR goggles and the Lab software so I can play with the garage. I have no interest in the rest of the Labo package. @Thumbsofsteel this feels like a half-arsed attempt, it's great for someone with a budget i guess, but the big bois are still top of the list, the VR labo is a novelty item at best. @Pod so, two different 3d renders per frame - one for each half of the screen. And this running in handheld mode which has less GPU power. BoTW runs at 30fps? So I'll be surprised if this runs at more than 20fps consistently. This isn't VR. This is switch 3D. Unless they say a second set of controllers are needed for the head tracking. @NEStalgia That's not VR. It's just 3D. Although as I understand it, without a very high resolution screen, which the Switch does not have, the images will appear pixelated when you put the screen that close to your face. @Cathousemaster Running two 30fps videos at a resolution of "500x500" shouldn't be that hard. They were doing this kind of thing for the past 8 years on the much weaker 3DS. Also, you said: "And the screen doesn't have any motion sensors... Which means no head tracking.". That's just not true. There are gyroscopes and accelerometers inside the Switch itself (as mentioned in the Discover section of Labo). Edit: Just had to look that up, and the 3DS had 400x240 per eye, and the Switch is a lot more powerful than the 3DS so I don't think it's much of a stretch to imagine it doing that. This is a relatively inexpensive construction toy for children. The 500x500 for each eye isn't meant to impress anyone, only the gameplay experiences of the VR kit software working in conjunction with the physical toys are. The support for Mario and Zelda is mere to suggest that new system adopters might take a look at getting those games as well, to keep their evergreen status running, and a polite promt for the established audience of those games to maybe consider Labo VR for funsies. Classic co-promotion. Xoncerning the 20fps, I find it likely the Labo VR games are built from the ground up to match the full 72fps update rate of the Switch display. At that point, it would match the original crowndfunded Oculus dev kit from five years ago, and if early adopters claim for that to be a revelatory experience, then LABO might be that for some as well. I do think Zelda, which already had issue with maintaining a steady 30 at all times, would feel terrible with headtracking, unless a million adjustments to the graphics were made, to increase framerate. Which they might, as the drastically lowered resolution means you won't be able to see much surface detail beyond even a small distance in-game anyway. Though my money is on your suggestion. That it will be worse graphics AND same or worse framerate, and that you would not want it strapped to your face at all. Yeah, I figured as much from just the way the toys they've shown off are used. Nintendo would want children to feel sick and their parents to complain. All the promo material shows children in seated positions as well. BUT. The fact that the update to Breath of the Wild comes for free to everyone means it can be broadcast to any HDMI capable 3D-headset. And the emulation guys will quickly have it running 4K 90fps on the new batch of high-end VR enthusiast sets. @Pod Aren't all the modders using the Wii U version of Breath of the Wild? I just googled a bit and the only Switch emulators that I found are Yuzu (according to their game compatibility list, only a handful of games run in a playable way. BotW is rated as running "bad") and RyujiNX (their compatibility list says "unimplemented service", whatever that means). Also, the Switch distorts the two images on the screen and the lenses inside Labo VR reverse that distortion. Every VR headset has different lenses so the distortion has to change according to the headset you use. @Medic_alert The VR version of Hellblade: Senua's Sacrifice also has you floating behind the character like a camera and it is pretty great. Don't forget the 3DS isn't running as resource intensive games as the Switch is (3D even being disabled for some 3DS games). Not to mention the 3DS was designed with stereoscopic 3D in mind. @Nintendo_Thumb ok, I didn't know that about the switch screen. It's a strange use case - maybe they saw this coming. Supporting head tracking would make a big difference to this. Re: 3ds / pixels... That's not how things work. The resolution has minimal impact on fps .. its geometry and GPU. Rendering 2 Zelda scenes at half the resolution each will still take close to twice as long. This is all for a bit of fun though, and it looks like it's working... As it got people here excited. If Nintendo can double labo sales by adding a quick patch to Zelda and Mario, then that's a win. There is a reason this hasn't been announced for Mario kart... As it doesn't work well enough to release. Yet anyway. Casual gamer: LOL with this hardware? Dedicated Nintendo Fan: OMG Zelda VR? Hell yeah! VR Evangelist: VR is the end goal of all life in the cosmos. You will be assimilated. Keep your expectations low. I can't imagine the image quality/resolution being any good. I have Samsung's Gear VR with a Galaxy 7 and boy was the image quality on that BAD. I just can't look past have huge looking pixels in my face. Maybe the Switch 2.0 can do VR right but there is no way this can. No one has yet addressed how you keep this on your head. If this is just binoculars, than it's basically just a party trick. True, for a moment I was unreasonable enough to assume the Wii U version would be getting the update as well, which of course would make no sense at all. Though I'm surprised the Cemu guys haven't already found a way to force support for the most common VR sets in BotW. Seems a little more interesting to me that modding in Spongebob, but what do I know. I'm excited to try it out, but my main concern is how will you use it if it doesn't strap to your head? Second concern is the screen resolution. Maybe the Switch pro will be a VR model if the rumors are true. It's funny to see "anti-VR" people in here are suddenly all about it. Formulate your own opinion people. You can like things that Nintendo hasn't done yet. I was going to buy the VR kit already, but this makes it totally worth it. I'm interested but do find the cardboard puts me off. However the starter kit isn't that expensive so will wait and see what reviews say then I'll decide. @Anti-Matter Actually there's just 3 VR mini-missions in Odyssey, all which have you controlling Mario in 3rd party view, though a Theatre Mode is being added to let you re-watch the cutscenes in 3D. Alternately Breath of the Wild is being completely redone to support the VR, with gameplay remaining in 3rd person and over-the-shoulder 2nd person view, but the cutscenes are remaining in 2D according to the trailer.